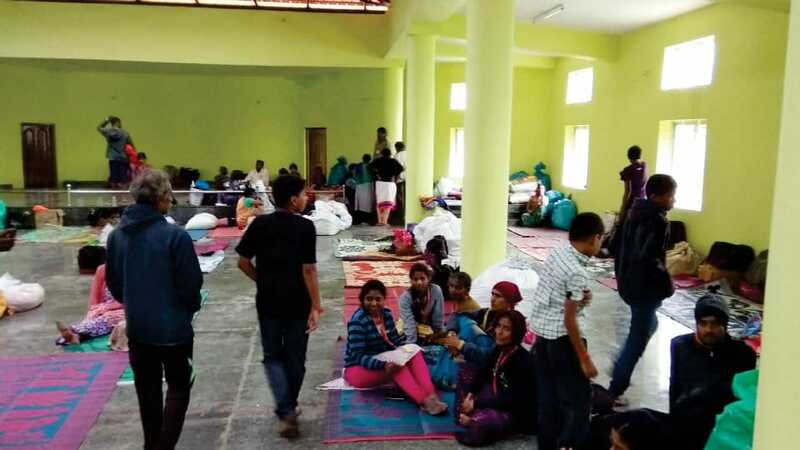 Kushalnagar: Nearly 220 flood victims taking shelter in the relief centres in Madikeri were reluctant to leave the centres and they took umbrage against the authorities trying to shift them here. Since the authorities insisted, they were moved to Valmiki Bhavan and the Government Hostel yesterday. As soon as they reached here, they found to their dismay that the authorities were totally unprepared. There were just two toilets in Valmiki Bhavan and six in Government Hostel and the whole place was very dirty. Meanwhile, two Revenue Inspectors, Madhusudhan and Ajay and a Village Accountant Gautam are coordinating the relief efforts. Even though they were caught unawares, they immediately were able to arrange four to five bio-toilets, which were installed in Valmiki Bhavan. For the victims staying in Government Hostel, apart from the six toilets in the hostel, they were allowed to use the toilets in the neighbouring college. Out of the 220 victims, 40 victims have left the centre and the remaining are still here, said Gautam. One of the victims, Ganesh from Makkandur speaking to Star of Mysore here this morning said that he had lost everything he possessed including eight acres of land, jeep, car and house that were all washed away. But the authorities forced them to shift from Madikeri to Kushalnagar. “If I was in Madikeri I could find some job. With my friends’ contact, I was already working in a hotel. It is difficult to find job here,” said Ganesh. Another victim Jalaja from Muvathoklu said that she has not been able to go back to her village as there is no road left. “Since I have no options I am living here. My daughter is married and even there was problem in her village. Hence, I did not want to go there,” she said. A relief centre set up in Government Model School has been cleared as all the inmates have moved back to their own villages or their relatives places. However, a few of them are still creating a nuisance coming in an inebriated condition to the centre thus causing problems to the teachers and students. Asked why they were coming back, one of the teachers told Star of Mysore that many of them were not allowed to enter their own homes in their villages as they were going back drunk. Hence, they were coming to the school where the relief centre was set up earlier and creating a nuisance.